So a few months back, I spent a week in Brazil. Most folks come back from a trip abroad with pictures of themselves in front of sightseeing attractions. I come back with photos of urban design ... and they didn't even come out that well. 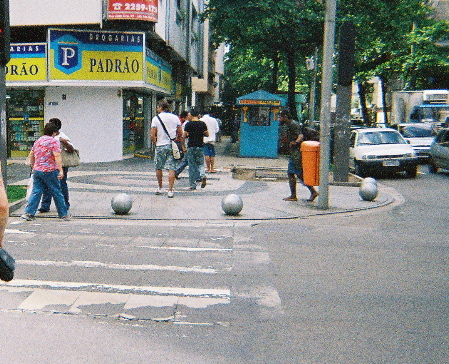 But I was pretty excited by the sidewalks in the Leblon district of Rio, where I stayed — and I've been reading City Comforts this week, which is all about this stuff — so I'm posting about it anyway. The most important thing about them is very difficult to photograph, because it lives the the succession of things that you see walking down the sidewalk. The buildings mostly have a gently partitioned relationship with the sidewalk: there are big shop windows, waist-high concrete fences topped with iron, rows of elegant little metal bollards, trees and bushes, and so forth. So even though the streets are narrow, they don't feel confining, and there's always something to look at. The sidewalks are also done with this tile mosaic in black and white, made into constantly varying big geometric patterns: swoopy curves and broad stripes. It really livened up the sidewalk, ordinarily so bland, in a simple and tasteful way. It made me think of the city of Neverness, in David Zindell's elegantly written SF novels, which he describes as marked with coloured stripes that make it possible to navigate the twisty, nameless streets; I imagine one might have a city with mosaics like Rio's that obey some rule, such that it would be impossible to get lost because the sidewalks always tell you where you are. The neighborhood also has slightly sunken bike paths in red brick. The paths weave in and out of normal sidewalk space, and the different colour of the ground keeps you conscious of when you should keep an eye out for cyclists --- and adds a little charm to the sidewalk. Notice, too, the little bollards in the centerline of the bike path. More gentle partitioning of the space. 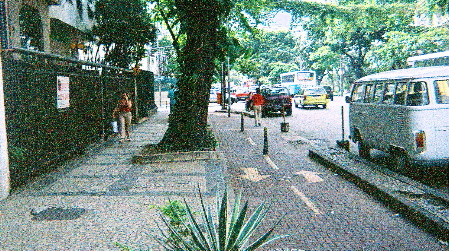 Many of the intersections — especially the busy ones — had a very distinctive partition between the cars' street and the pedestrians' sidewalk. Though most of the streets had curbs, the corners had the sidewalk flush with the street, but there were rows of silver balls set into the ground, about a foot and a half high. This was surprisingly effective in creating a psychological barrier between human and car space, and accomodated people on wheels better than the curb cuts that are common in the US. A beautiful, effective, and distinctive solution to creating that simple partition. Amsterdam also makes use of the slightly separate bike path. It's a little scary when there's a lot of bike traffic becuase you can brush against the curb. ... and points out a cool collection of pictures of bike paths around the world. These photos beautifully illustrated what your written words described. Thank you for sharing them. You might consider posting a photograph or two over at the Picturbation LJ group. We're always looking for a few good edifices. Also, have you seen this?